Why I was drawn to this book in particular may have been because of the title. For me, the Italian translator Ilide Carmigiani, or the Italian editorial and publishing team, got the title spot on. It really works. I don’t think The Story of Mix, Max and Mex would have intrigued me in the same way, despite the alliteration and linguistic games going on in the names of the main characters: Max, Mix and Mex. Maybe if they’d lived in Mexico, it might have seemed like an attempt at humour. But they don’t. They live in Germany. And this is not a comical story. 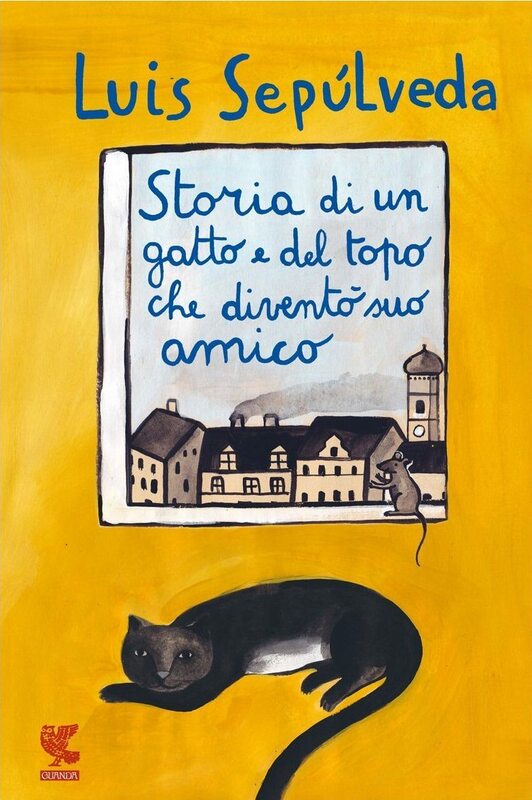 Sepulveda’s new children’s book is a sentimental tale about a cat and a mouse, quite rightly presented with the slightly longer, almost narrative title of The Story of a cat and the mouse that became his friend. It conjures up images of grandparents holding children riveted with ancient tales, inherited from their own grandparents, important values and lessons being conveyed from generation to generation. We all remember that story that granny used to tell ….. Stories often talk about normal, everyday things, but present them in a way that challenges how we normally think about them. Sepulveda’s new story is a classic example of the genre, in the same way as The Story of A Seagull and The Cat Who Taught Her To Fly did. Both reveal the secret of friendship, of promises made and lives shared. As Roald Dahl once wrote, “the greatest secrets are always hidden in the most unlikely places”. In this case, the most unlikely places are the ones right under our noses. In a boy, a cat, and a mouse. I wondered why a cat would be making friends with a mouse. Aren’t they supposed to be arch enemies? I decided to find out and liked the story so much, I couldn’t wait to get to my desk to look for the English version. There had to be one.. after all, Sepulveda’s works have made it into more than 50 languages. Then I looked at the publication date. The Italian translation had made it into my local newsagents just 2 months after the first edition of the original Spanish copy in November 2012. Duly impressed, I realized that an English translation is most probably in the pipeline …somewhere. I hope so, because it’s a gem of a story that needs to be shared. It’s a story about friendship. Max grows up with a cat called Mix. They are friends. 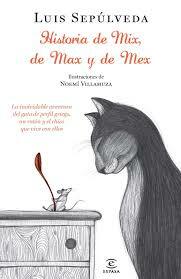 Mix meets a mouse called Mex. They make friends. To some it may be a little sentimental at times, but the low-key, almost bare language in parts, preaching without being preachy, “a friend understands the other’s limits and helps him” (no should, must, ought to, just a simple present. Cos that’s the way life is) saves it from being sickly or unsubtle, criticisms aimed at his previous story about the (sick) seagull that makes a cat promise to look after her egg. The friendship between Max and Mix has some unwritten rules which, by inference, the reader realizes apply to life in general. This is clever, because it doesn’t make the insights being shared feel like a lecture. Max and Mix both know that friends look out for each other. Friends understand each other’s limits. Friends go to great lengths for each other. When Mix’s feline freedom is unexpectedly curbed and Max is now grown up and out at work all day, an unexpected new friend is found in a mouse. The cat and the mouse realize they both have something that could help the other. So they share. And both their lives are enriched by it. I could say that Mix is Max’s cat, or that Max is Mix’s human, but since life teaches us that a person can’t be the master of another person or animal, let’s just say that Max and Mix, or Mix and Max, are important to each other. Max and Mix, or Mix and Max, used to live in a house in Munich, and the house was in a street lined with tall horse-chestnuts, magnificent trees that provided much shade in the summer and were a constant joy for Mix and a constant concern for Max. Once when Mix was little, having sneaked out into the street when Max wasn’t looking, he felt adventure call him, he climbed up to the top of a horse-chestnut and when he got there, he discovered that climbing back down was harder than climbing up, so, clinging tightly to the branch, he meowed for help. I hope you enjoy the story – or this little part of it – as much as I did. I also hope it won’t be too long before we can read the full version in English. Sepulveda writes the kind of stories that last. The ones you learn something from, that you want to share with your friends, your children, and your children’s children. The classic carousel of emotions, as calm and content turn to tragedy then back to tranquility again, with a little help from a friend. Reblogged this on benim şarkılarım.